the uk government is considering replacing the controversial air passenger duty with a tax based on flights rather than passengers. During pre-budget review proposals, the uk government said that it would do away with its air passenger duty (apd) from November 2009 and replace it with new taxes on airlines based on each plane they fly. "I propose that aviation makes a greater contribution in respect of its environmental impact and for this to be as environmentally effective as possible, from 2009, I intend to levy the duty not on individual passengers but on flights," said Chancellor of the Exchequer Alistair Darling during his speech. However, details of the plan would come after a year-long deliberation between the government and airlines, green groups, passenger organizations and the business community, he said. Analysts say the government must consider certain issues while planning for the new aviation industry taxation regime. The change from the current apd paid by passengers could lead to a tax on both passenger and freight aircraft flights. 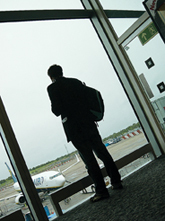 This means passengers may end up paying more as operators seek to meet the cost of taxation. The move could affect uk's air-travel, tourism and aviation-support industries, they say.